Fences types. Wood, vinyl, iron, chain link fencing materials. Depending on purpose there are different types of fences divided into separate categories by style and material used for its construction. Cost to install a fence will be determined by the type of a product. Cedar is one of the most popular wood species for building fences because of natural resistance to moisture what makes it perfect for outdoor projects. Treated pine is also a good option for “on budget” installation because of much lower cost. To prolong the longevity of a wood fence application of protective materials after fence installed is a common practice. Wood stain will allow making a fence desire color and matching with any outdoor design. 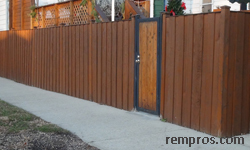 Vinyl fences come in different colors from manufacture and there is no need in painting. It is very durable material in term of withstanding any weather condition and will never rust or rot. 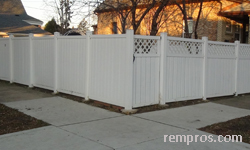 With a proper installation vinyl fence will last for many years with minimal maintenance. Enhanced technology allows producing vinyl fences imitating a stone of brick appearance at significantly lower cost. Chain link is one of the most cost effective fencing options. It is easy to install, long lasting and very popular in residential and commercial applications product. Typically it is come in rolls 48”, 60” or 72” high for particular purpose. Decorative privacy slats can be added as an additional option to improve the fence appearance and increase the privacy function. Aluminum fences available in variety of designs and styles and come from manufacturers as a separate sections different sizes. There are some standard colors available to choose from including white, black, tan, bronze or green. By its nature aluminum is resistant to corrosion what makes it perfect for outdoor use. Aluminum fences are available as a mechanical construction, meaning the whole fence assembled from separate parts connected with fasteners, making it convenient easily to change the damaged components. Most of steel fences similar to aluminum come in welded panels different sizes ready for installation. Custom design can be made at a job site by professional welder but it will raise the price significantly. Steel fence is much heavier in comparison with aluminum option and require application of anticorrosion paint or any other rust protective solution. There are two types of iron fences – wrought and cast iron. The only difference between two of this options is that content of carbon in wrought iron is lower what makes the material easier to work with in term of making shapes and design. 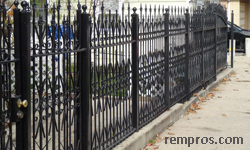 Iron fences will easily rust if left outside without primer or paint application. Iron is a very durable fencing material and strong to enough to withstand sever abuse. Brick fences are on the top of a list when it comes to rich and elegant look. It is the best option when the security is a main concern. With endless possibilities in matching any outdoor design brick fences are suit the best to highlight the fashion of high end custom homes. The main concern about brick fences is a price. Professional installation and cost of materials will run 10 – 15 times more in comparison with a wood or other fencing option. Building a fence doesn’t mean there is will be only one type of fencing material use. It is a very common practice to incorporate two or a few products to get the best results in general appearance and fence function.